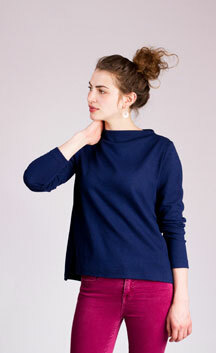 Toaster Sweater #2 is a semi-hi-neck top designed to keep you toasty warm and stylish in the cooler months. It is very simple to sew and perfect for sewists of all levels who want to try their hand at sewing knits. All Sew House Seven patterns come as multiple PDF files consolidated within a single .zip file. Download and save the .zip file to a computer to access the PDF files. Downloading .zip files to mobile devices is not recommended as most phones and tablets cannot open them. 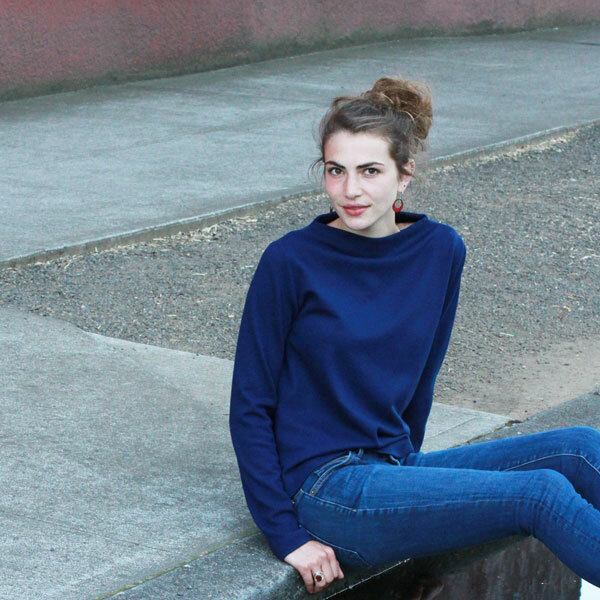 Toaster Sweater #2 is a semi-hi-neck top designed to keep you toasty warm and stylish in the cooler months. It is very simple to sew and perfect for sewists of all levels who want to try their hand at sewing knits. 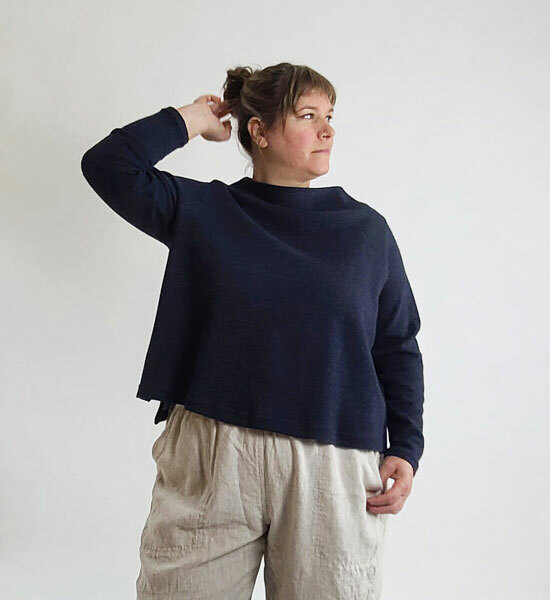 This sweater was designed to be constructed using knit fabric with at least 20% stretch around the width of the body and preferably something fairly stable to keep the neck from collapsing. 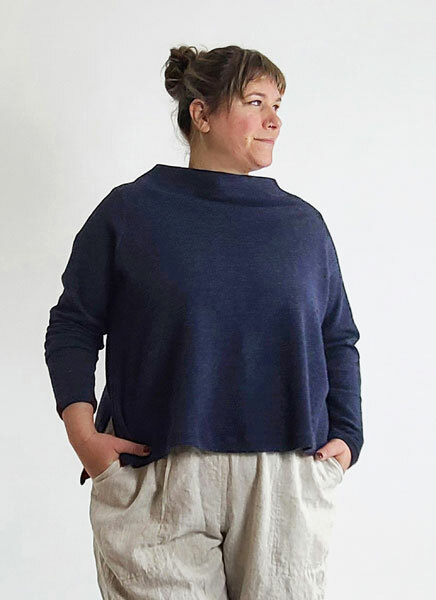 It is an easy top/sweater that can be dressed up or down. It is somewhat fitted through the shoulders and sleeves and then swings out a bit at the underarms and hem. It features a semi-hi-neck that takes its inspiration from funnel and boat necks. It also has mitered side vents with a hi-low hem that is 1" shorter in the front than the back. The front hem falls just below the high hip. 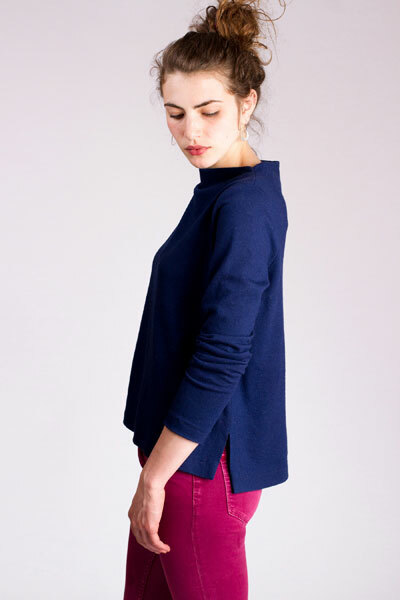 Sew it in a boiled wool knit, a wool jersey or ponte for a more dressed up look. Sew it in a sweatshirt fleece (with stretch) or jersey knit for a more casual look. Mid-weight stretch fabrics with at least 20% stretch such as wool jersey, knit boiled wool, ponte, stretch woven wool, some sweatshirt fleeces, heavier jersey knits. Click to enlarge the final image at above right. This project took me about an hour after it was cut out. Not too complicated, with very clear instructions. A beginner could tackle this project without too much frustration. I am 5'7" tall....and I added 5" to the length, which I am very glad that I did. The proportion seems better on this old gal.